Supports uploading a list of emails using a csv formatted file and generating an invitation code per each email. Can also generate mass invitation codes without emails. 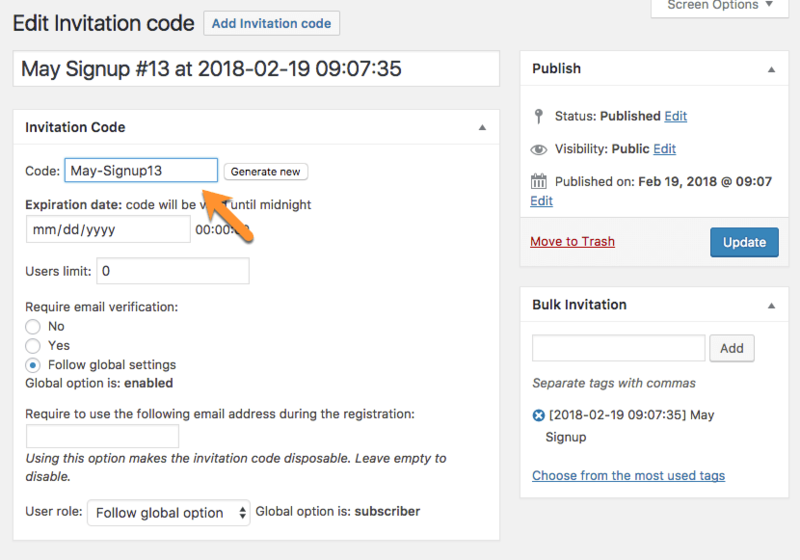 The Registration Bulk Email Invitation Addon for WordPress supports uploading a list of emails using a csv formatted file and generating an invitation code per each email. 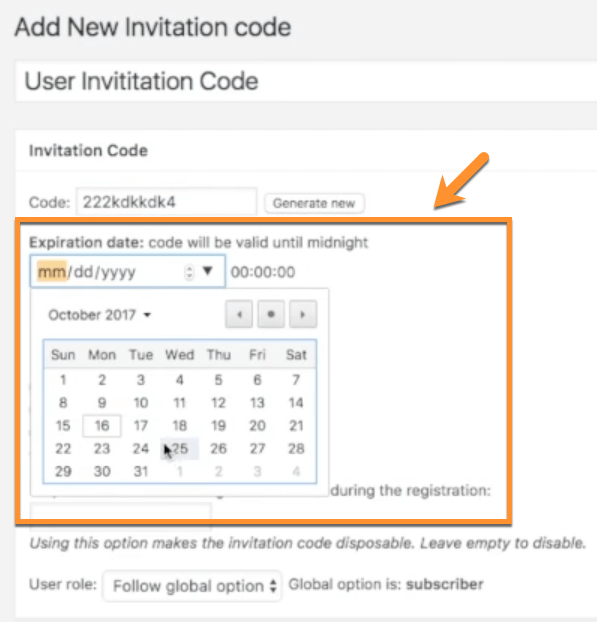 Invitation codes sent can have an expiration date and the admin can edit the email sent to users receiving this invitation. You can import a table file with the list of email addresses that will receive the code. 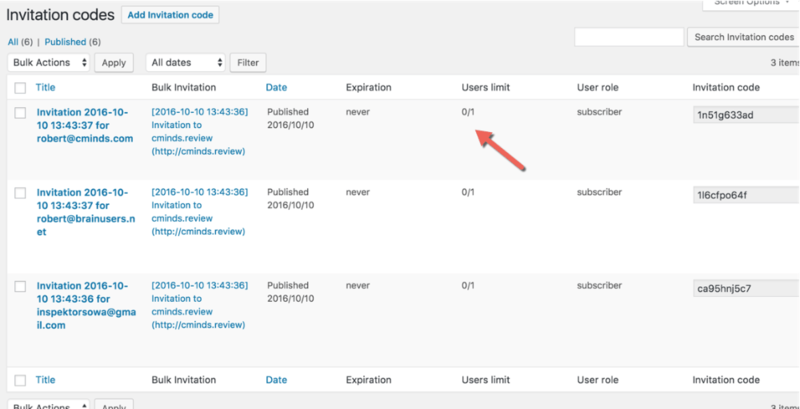 It's possible to set expiration dates and the user role assigned to the new members. This add-on can also generate mass invitation codes without email addresses. Additionally, it gives the option to automatically send the invitation code directly to the user upon uploading the file. For a detailed user guide, check this link. Upload CSV file with codes – Import an existing list of invitation codes from an external program using a CSV file. 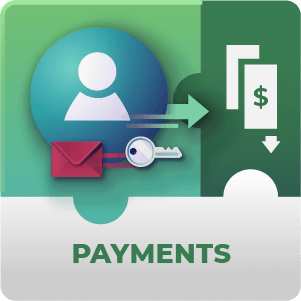 Generate Serial Codes – Generate a serial invitation codes. For example isi001 – isi999. 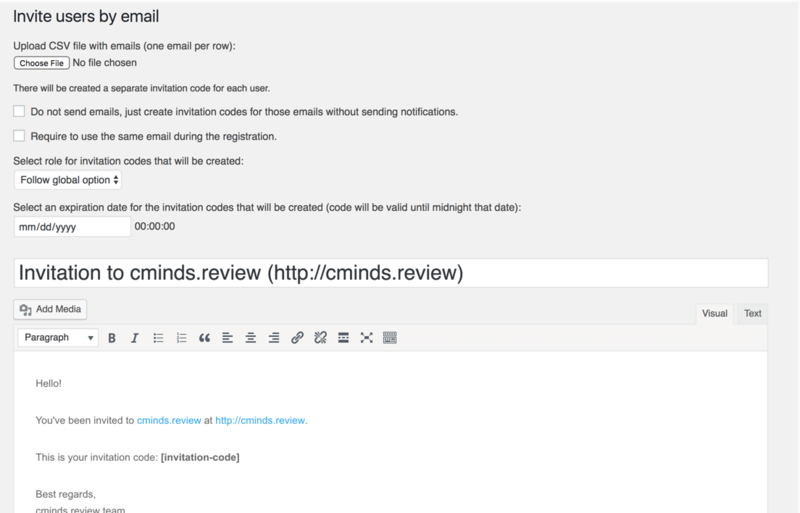 Send Codes to Users – Generate and send list of invitation codes to users’ emails. 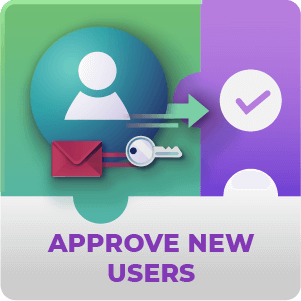 Generate Random Invitation Codes – Generate random invitation codes without assigning to user emails. Prepare an Email Template – In case of an email sent to users, prepare an email template which will be used with the email sent to each user. Supports HTML and shortcodes. Define Code expiration – For each code define the expiration days and the number of times it can be used. Set User Role – Define the user role which will be set per each invitation once they log in. Can bulk invitation codes be set to have expiration dates? Yes. The codes can be set to expire on a certain date. Expiration dates for codes are set either when the code is being first made or can later be edited. To learn more about expiration dates see this Help article. Is it possible to create my own custom or "vanity" invitation codes? Yes. 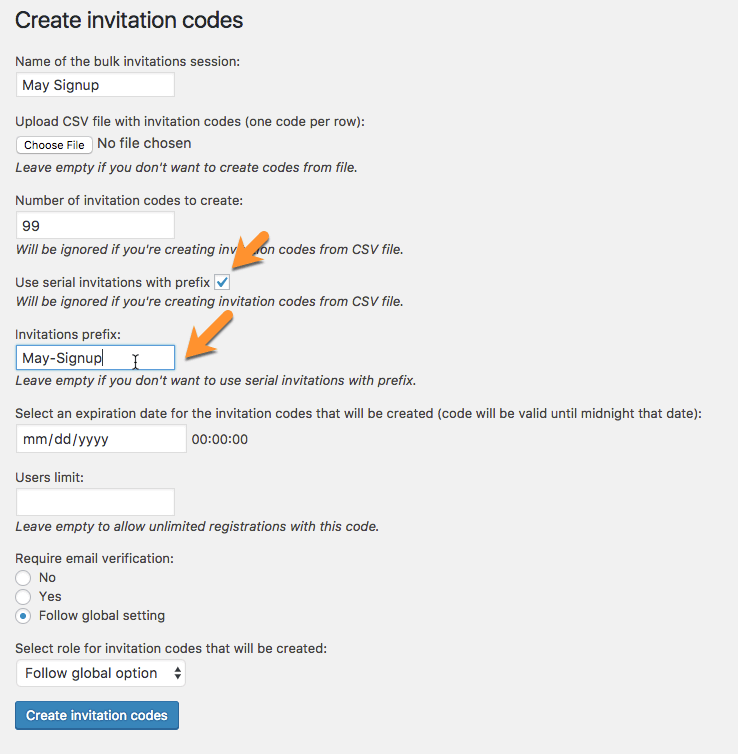 With the bulk invitation add-on you can create custom or vanity invitation codes. This allows you to make the code relate to your brand or to to be more understandable for your customer. You can either individually name codes by going into the edit view and change the code to something more custom there. Or it’s possible to assign a custom prefix which will be followed by a series of numbers from 1 to the number of codes you are creating. To learn more about creating custom / vanity codes see this Help article. Can I import a (long) list of Invitation codes into the site with this plugin? Yes. It’s possible to import a list of codes. You will first have to export or convert the list into a CSV file. This is a handy feature if you have invitation codes from some other service or application such as a mailing list and want to provide something to customers they will recognize. To learn more about importing invitation codes see this Help article. Can I view and edit one collection of invitation codes at a time? Yes. 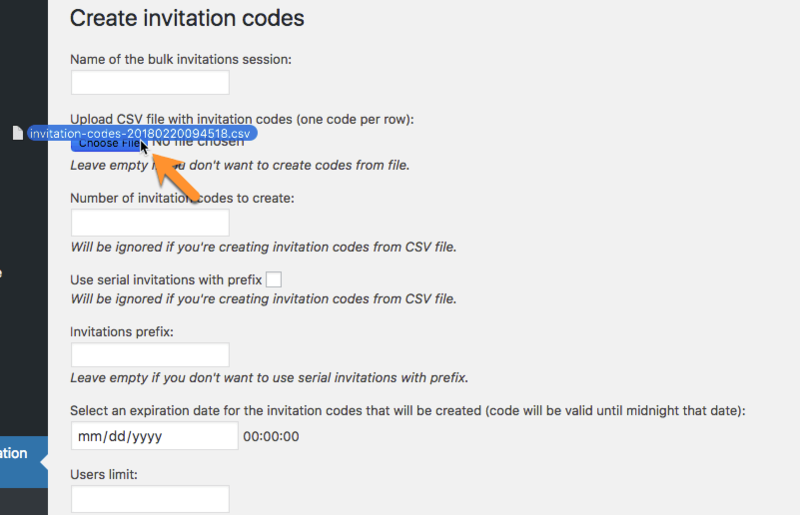 There is an option to isolate and modify individual sessions of invitation codes. 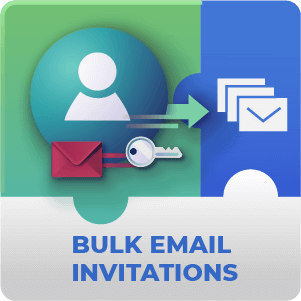 Sessions can be thought of as campaigns or collections of invitation codes that you make using the bulk invitation code add-on. 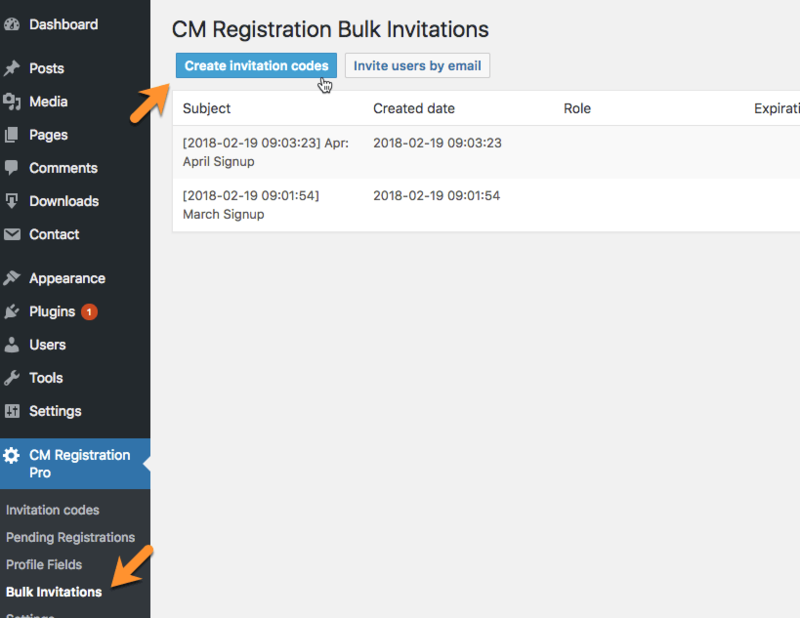 Bulk actions can be applied to collections of invitation codes, such as deletion or downloading or all the invitation codes in a collection can be viewed. If I mess up while creating invitation codes in bulk can I delete all those codes easily? Naturally. We’ve thought of that and if you notice you’ve made a mistake too late you can delete all of the invitation codes created during a session very easily. Can I customize the email that is sent by the bulk invitation codes add-on? Yes. 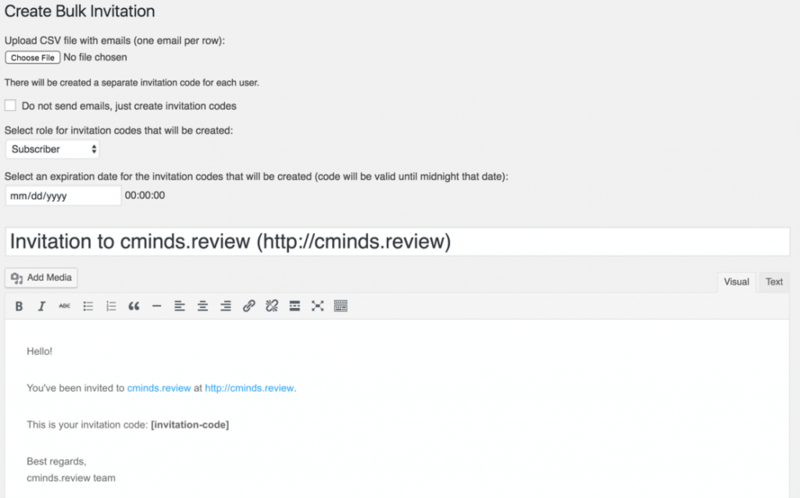 The email that gets sent out by the bulk invitation codes add-on can be completely customized. There are also some shortcodes that can be included to make the contents of the email more dynamic and relevant to the site and customer. You can also compose the email using the rich text editor or using HTML for some light styling. Can a long list of email addresses be imported from external mailing lists services? Yes. You will need to find a way to export or convert your mailing list to a CSV file first. Then once the list is in a CSV format check that it follows the layout required by the Bulk Invitations add-on. To learn more about importing email addresses see this Help article. 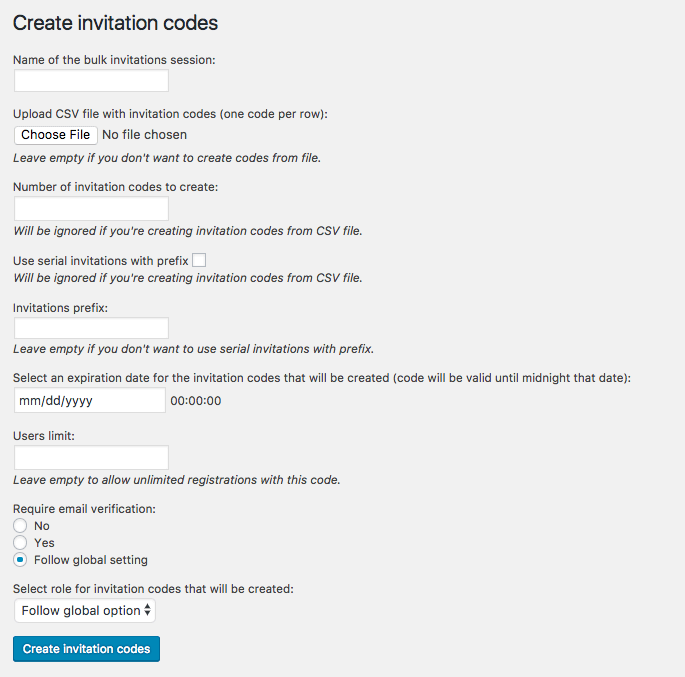 Added option to upload invitation codes from CSV file. Added creating serial numbered invitation codes. Added option to create multiple invitation codes without sending emails. Added option to the “Invite by email” form to require the same email to register with that the invitation code came into the user.